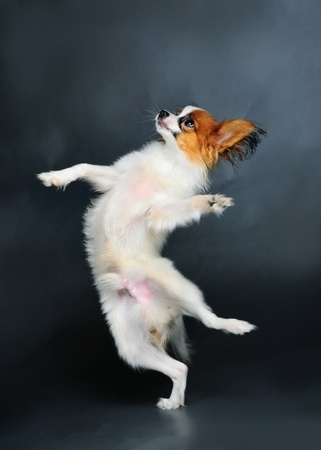 Strictly Come Barking: Teach your dog dancing! Posted by Sapphire. November 26th 2015. Strictly Come Dancing 2015 is well underway and dance fever is once again gripping the nation. With Christmas just around the corner, there’s no better time to put on your dancing shoes and learn some new moves in time for the festive party season. Here at Argos Pet Insurance we’re all for our four-legged friends getting in on the action too. With dog dancing, they can! 1. Twirl: This basic trick forms the basis for all kinds of more complicated moves so it’s a great place to start. 2. Circle: This simple move is when your dog circles around you, either clockwise or anticlockwise and can eventually be built upon to create more complex routines. 3. Stationary Leg Weave: This involves your dog weaving in a figure of 8 around your legs as you stand still. 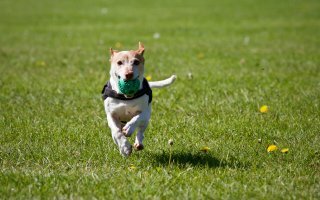 Once mastered, your dog can really pick up some speed doing this move and it can look really impressive. 4. Forward Leg Weave: This is pretty much the same as the last move, only this time your dog weaves around your legs are you walk forwards. This move is a bit harder and requires you and your poochy dance partner to be in-time to avoid you tripping over each other. 5. Paws on Feet: This is an adorable and impressive move that is relatively easy to teach and learn but it takes dedication to master. Go on, have a bit of fun! You and your pooch may never rival Britain’s Got Talent champions Ashley and Pudsey. You may never compete for trophies and rosettes at Crufts. But you’ll certainly have lots of fun with your canine companion as you both learn the art of dog dancing. You don’t necessarily need much rhythm to take part; remember your canine companion really does have two left feet so you can’t use that as an excuse to avoid the dancefloor! All you need is a willing doggy dance partner, a lot of patience and huge quantities of dog treats! Once you’ve mastered the move above you can mix them up and have a ball creating your own dance routines!